"What's this? A post about Galactic Starfighter? What has gotten into you?" Wellll... one thing Galactic Command has achieved is that it has made me dip my toes back into some types of content that I hadn't really engaged with in a while, GSF being one of them. I'm still not exactly a huge fan, but at level 70, each match provides pretty nice Command XP, and doing the daily mission on occasion makes for a nice break from my more common CXP farming activities (such as ops and regular warzones). 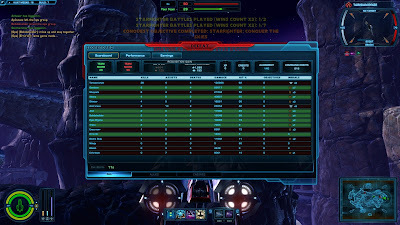 However, it also hasn't taken long for me to be reminded of all the things I don't like about GSF, such as the gameplay being so highly skill-based that a single guy can pretty much solo an entire enemy team if they are noobish enough. (I was on the losing side of a death match where a single enemy racked up 38 kills.) Not to mention that after three years, even I'm ready for a new map, gameplay mode or ship type. However, those are things that are suggested by GSF fans all the time and seem to require too many resources to be worth it from Bioware's point of view. So let me instead talk about three things that would be (comparatively) easy to fix as far as I'm concerned. I'm not a big fan of playing "UI Wars" and another one of GSF's weaknesses (in my opinion) is that there's a big "UI hump" to get over if you want to play anything other than the default ships and loadouts. Which new player actually enjoys clicking their way through all those boxes to read dozens of ability and talent descriptions? But I get that the information has to be somewhere. You know what would be the best time to familiarise myself with all these features in small chunks? When I'm queued for a GSF match! At least from my current experience, the queues tend to be long enough that you don't just want to stand there doing nothing (30+ seconds) but at the same time short enough that it's not worth running off to do dailies or anything while you wait. But of course - INSERT KLAXON NOISE HERE - the moment you queue for a GSF match, all the other items in the GSF UI become locked and can't be interacted with anymore. I'm guessing that there is some kind of tech reason for this, but I'm not sure what it is, considering that your loadout doesn't seem to factor into the matchmaking and you can change ships during the match anyway. Either way, even though it's only a minor annoyance in the grand scheme of things, it still ticks me off to no end, because even after all this time, I keep trying to interact with the UI while queued ("Oh, I have a lot of unspent ship requisition! Ah right, I guess that will have to wait until after the match...") just to be foiled for reasons that don't make sense to me. This one's not really for me personally, because thanks to having been a subscriber when GSF first came out (or at least I think that's the promotion it's from), all my characters have access to at least a free gunship at the start. I'm absolutely hopeless at flying either a strike fighter or a scout, so that free gunship is my only shot at having some fun, even if I'm not very good at it. I think it makes zero sense to limit new players to the two ship types that require the most skill to play at even a mediocre level. I get that Bioware was hoping that people would buy more ships from the Cartel Market or whatever, but I think we've had ample time to see that if players are off to a bad enough start with GSF, they won't even bother to stick with the game mode long enough to contemplate acquiring more ships. If you want them to warm up to starfighting, you need to give them the option to start at a level of play that is actually appropriate for their skill. One of my biggest peeves as an eternally somewhat hapless GSF player is when I don't understand what's happening to me. Most often this will manifest itself in my ship appearing to get "stunned", meaning that I slow to a crawl and none of my abilities will fire even though they're not on cooldown. 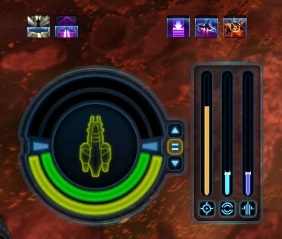 Obviously this is connected to a certain type of attack from a certain kind of enemy ship, but I'll be damned if I know what it is, because my only indicators are tiny debuff icons above my ship's health, and it's not like in the normal game where I have a cursor that I can use to hover over them to read the tooltip. I guess I'm just supposed to memorise the tiny pictures and then try to find their equivalents in the loadout menu afterwards? Bad stuff about to happen, that much I know. Anyway, I know that even these things will likely remain nothing but pipe dreams as they would still require actual coding time and Bioware doesn't seem to have much of that to spare for GSF either. I just felt like getting these thoughts off my chest. It would also help if they offered more explanation of what each of the more obscure bits-and-bobs did. Obviously everything about weapons, systems, engines, and shields is alright, but then there's nothing in-game which defines the importance of Sensor Communication, Range, Focus Range, and Dampening. Okay, yes, you can accurately guess what Range and Dampening do, but Focus Range and Communication aren't so easy to work out. From what I understand (having looked it up on the official Forums due to my own confusion on the matter), Communication Range puts opponents on the map when a team-mate whose own Communication Range overlaps with yours uncovers them. I'm still not overly clear on what Sensor Focus Range does, though. That last pic, showing the shields, looks right out of X-Wing, TIE Fighter, and X-Wing Alliance. Maybe I ought to give GSF a try. I'm afraid I couldn't tell you how it compares to those games. But you can easily find some gameplay footage on YouTube to see for yourself.